The CIP-1000™, Controllable Isothermal Plate, is a system for providing an isothermal surface that can be precisely temperature-controlled from 10 to 170°C with an accuracy of +/- 0.1°C. 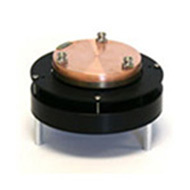 The CIP-1000™ features a 75 mm diameter isothermal copper plate whose constant temperature can be raised or lowered both automatically and manually. A three wire RTD sensor and integral PID controller ensure specific, uniform temperature across the entire plate. The laboratory-quality CIP-1000™ system includes a separate controller unit that allows both pre-programmed and hands-on temperature management. The controller communicates with a PC through a choice of either a USB or RS232 connection. The included stageTHERM™ software allows easy temperature variation of the isothermal plate for testing and other applications. Different plate temperature settings can be programmed for automated ramping, including hold times for each step. Alternatively, the temperature of the plate can be manually adjusted in increments as small as 0.1ºC using the system’s digital controls. Time and temperature data are accurately recorded and can be downloaded or viewed in easy to read graphs and tables. If needed, the CIP-1000™ plate is easily removable for rework, surface treatment, attaching DUT and other such tests. The CIP-1000™ can be used in a wide range of applications, including component and environmental testing, product development, quality control and life science studies. The system can also be customized for special applications including larger plates and different temperature ranges.